Most of the portfolios and strategies I cover on Robotic Investing are not buy and hold. For example, Dual Momentum and the 12% Solution both use momentum to allocate capital. The Coffeehouse Portfolio does not do that. In fact, other than annual rebalancing it is strictly a buy and hold portfolio. Buy and hold can mean a couple of things. It can mean buying a stock like Apple and never selling it. Or it can be buying a set portfolio, and never selling it either. For the purposes of this article, I am going to refer to a buy and hold portfolio. A buy and hold portfolio is simply setting up a desired asset allocation, buying index funds to meet that asset allocation, and holding that forever. 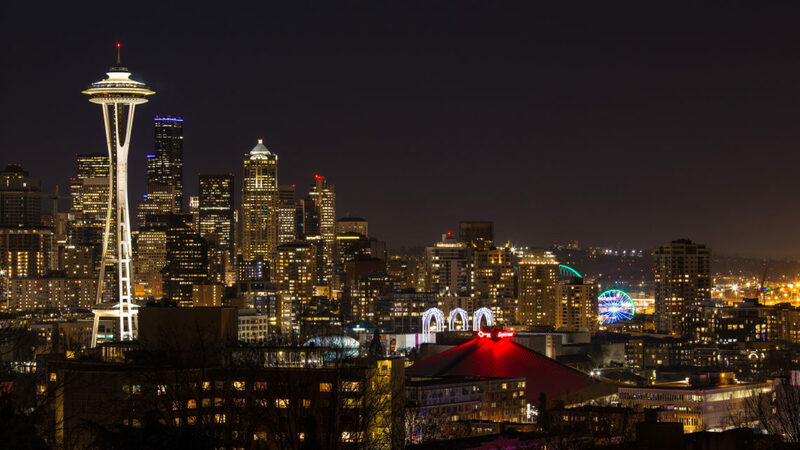 For a number of investors, that is exactly the right type of portfolio for them. These types of portfolios are often called “lazy portfolios”, simply because they require little to no maintenance. Once the initial purchases are made, you can either leave it alone, or at most rebalance back to your chosen asset allocation every year. The allure of buy and hold investing is its simplicity. Simply buy the assets you want to hold, and never sell. One the more famous buy and hold portfolios is from author Bill Schultheis. Bill wrote the best-selling book, “The Coffeehouse Investor: How to Build Wealth, Ignore Wall Street, and Get On with Your Life“. In this book he lays out his investment and savings approach, and outlines a recommended portfolio. Let’s get into the details of what the Coffeehouse Portfolio is. 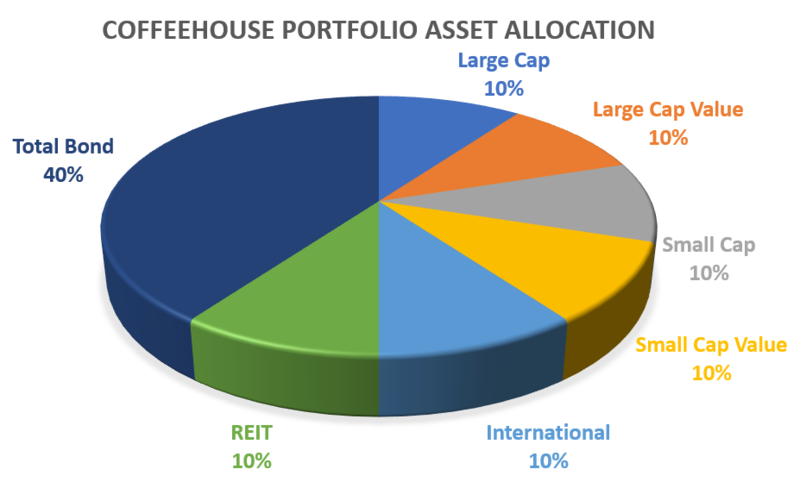 The Coffeehouse portfolio starts with a very traditional asset allocation split. Bill suggests that for most people, a traditional 60/40 split works well. For those who are not sure what a 60/40 portfolio is, it is a portfolio where 60% of an investor’s assets are put into equity index funds. The other 40% goes into fixed income. The 60% portion of the Coffeehouse portfolio is invested into six different funds. Each of of these funds capture a different part of the market, adding to the diversity of the portfolio. 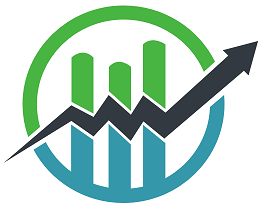 The 40% portion of the portfolio is invested into a total bond fund that tracks the entirety of the bond market. That is really all there is to it. An investor in the Coffeehouse Portfolio would only need to find cheap index funds that track these asset classes, buy them and then walk away. It is suggested that the portfolio is rebalanced every year. That ensures that the above asset allocation percentages are kept at the correct amounts. That is a personal choice for most investors. For the portfolio tracked on Robotic Investing, I will be using the ETFs listed in the table above by iShares. The reason for going with that over Vanguard is because the iShares ETFs have been around longer and I was able to run the backtest you see below for a longer period of time. I ran the Coffeehouse Portfolio through the backtest engine at Portfolio Visualizer. The tickers I used were the ones listed under iShares in the table above. I was able to go back to 2003. I would have liked to test this further back, but the ETFs I chose would not allow we to do that due to their inception date. As you can see, the system produced a 6.75% CAGR since 2003. This did not beat the S&P 500, one would not expect that from a portfolio with a 60/40 split. What an investor gets with the Coffeehouse Portfolio is a lower maximum drawdown, and a better “worst year”. For example, the portfolio did better in 2008 than an investment in SPY. Buy and hold requires that you hold all assets no matter what the prices are doing. Many of the equity assets are correlated to one another now. They used to return different values, however this effect seems to be going away. As a result, the protection that the portfolio says you will get by being diversified is not there like it used to be. A 60/40 split is too conservative. Of course an investor can adjust this with the Coffeehouse Portfolio, however the one size fits all approach does not work for me. 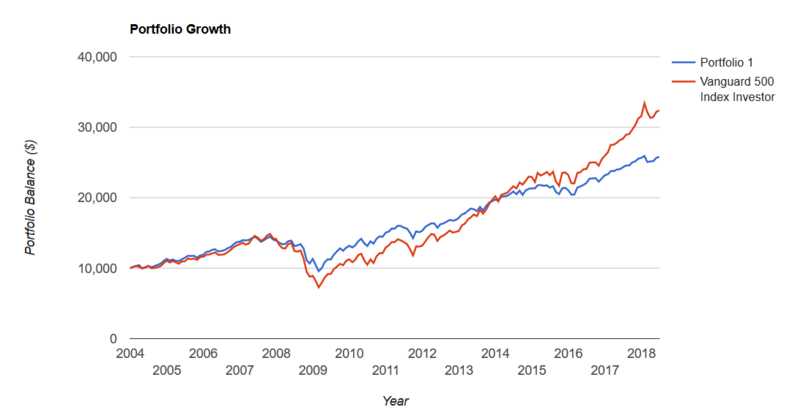 I want to be more aggressive and go after market beating returns. I track real-world implementation of the Coffeehouse Portfolio. To see how the portfolio performs in real-time and the real world, check out all the blog posts tagged with Coffeehouse Portfolio category (see sidebar).